As promised in yesterday’s belated and no doubt riveting debate post about the ever-popular summer road trip, the time has come to wow and regale you with the story of our vacation. I promise I’ll try to keep the slides to a minimum. Everybody comfy? Originally, the Puddinette and I had planned to make this kind of an off year for vacationing, meaning nothing to far away or extravagant. Somewhere in our not-so-distant future lurks a visit to that money-grubbing mouse in Florida, and my understanding is that a trip to Disney World costs somewhere between the value of a new car and your first born son. Naturally, I was willing to consider the “take four kids, leave with three” option – consigning the Puddinpop to a modest term of indenture in a Disney mascot outfit – but the Puddinette was apparently having none of that. So, a beach, then. 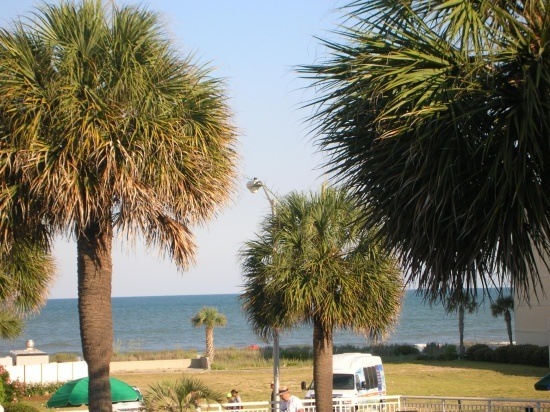 We settled on Myrtle Beach, partially because it’s not too far away and partially because it’s one of those places everyone’s supposed to have been by the time they reach adulthood. Guess who’s got two thumbs, is 39 years old, and had never been there before this week? This guuuuy. Of course, the scary thing about travel is that, well, by definition, it requires traveling. Even the most upbeat and positive Sally Sunshine can be brought to his/her knees and power-wrenched into coping with a stress-fueled headache, the Permanent Scowl of Doom, and heaven only know what other cranky horrors by hiccups in one’s travel plan. So the daunting thing about our planned trip to Myrtle Beach was the fact that it’s over eleven hours away by car. Now, I know eleven hours doesn’t sound like a long time, but you have to remember that we’re talking about eleven hours in semi-perpetual motion while The Attitude sits strapped into a five-point harness and tries not to go all Mr. Hyde on everyone within screaming/flailing/flinging distance. The Puddinette isn’t too fond of sitting still for extended periods of time either. To reduce the looming threat of ruining at least one of our precious days away, we planned a leap-frog a trip. On the way to Myrtle Beach, we stopped overnight in Asheville, NC where we sampled some fine local brews and visited the enormous Biltmore Estate. On the way back, we visited Knoxville, checked out the Sunsphere Tower, World’s Fair park, an awesome brewpub, and a pretty cool little general store. See? 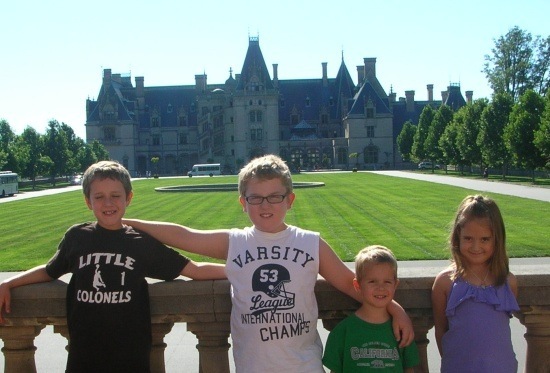 The puddinlings take a moment to cheese for the camera in front of the Biltmore lawn and main entrance. Not to rub it in, but this was the view from our hotel balcony. Not bad, eh? 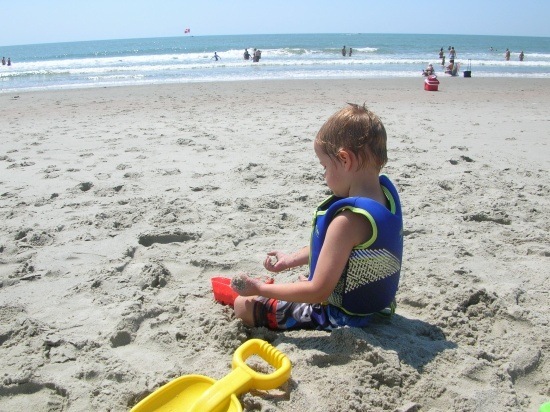 The Attitude, in a moment of serene reflection on the beach, contemplating the construction of a massive sand castle so he might demonstrate his unequaled power…by knocking it down. 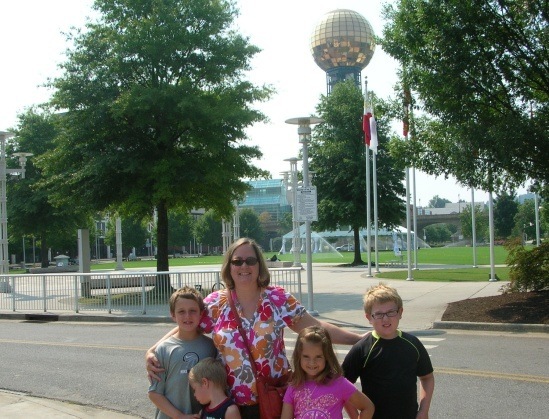 The puddinlings again (The Attitude had adopted a stance of protesting all photos by this point), but this time with the Puddinette, before the impressive Sunsphere tower in Knoxville. Did you know they have corporate office space in there?! I’m glad to report that the trip was a complete success, and we all returned alive, well, and ready to hit to sand again as soon as possible. In fact, tomorrow would be good. Can somebody make that happen, please? In any single enclosure* where four or more people are attempting to sleep, the, um, snorers will be outcast in groups. That’s how Mini-Me and I ended up sharing the pull-out bed in Asheville, like some kind of dreaded Island of Misfit Noses. In any place were tourists congregate, the modern equivalent of P. T. Barnum (usually in corporate form) will provide a large, flashy area where fools and their money are soon parted, usually for overpriced food or trinkety junk of various sizes, shapes, and colors. Put more simply, They &*%! you on the boardwalk. I do not like these places. I always scoffed at the idea of places like Medieval Times, where (I imagined) you paid exorbitant amounts of money for half-rate food and a “jousting tournament” less compelling than your average Renaissance Faire. And I was wrong. Yes, the place ain’t cheap, but considering the other ten thousand ways one might spend a similar amount of money on lesser food and entertainment that includes little more than counting the extravagant piercings of passers-by in the flickering neon of the “tourist shoppes,” it can be money well spent. Seeing how the kids ate up the show was value enough for me. The roasted chicken was pretty tasty too. Spray-on sunscreen is evil incarnate. You press the button and watch a mist of UV protection burst out and appear to attach to one’s target area (aka, my shoulders). However, any actual protection from the sun wafts away on the sea breeze, leaving someone (aka, again, me) doomed to skin crispy like pork cracklins. Now matter what face-reddening behaviors you participated in during your misspent youth, no walk of shame you’ve ever experienced will compare with striding out of the local Dollar General after one of your darling children chooses that “quick” trip to grab some new sunscreen (see lesson #5 above) as the perfect moment to answer the call of nature, thus reducing the restroom in the stockroom, adjacent to the employee lounge, of course, a biohazard. That, my friends, is a Walk of Shame. More seriously, as someone who has not been a huge partaker of the dreaded “family vacation” in the past, I realized that vacations used to be about claiming a few precious days of rest and relaxation for myself, and little else. But these days, a vacation isn’t just about making myself a lazy camper, but getting to see the world and exciting new things through the eyes of my children. Sure, a book or a nap on the beach is a fine thing, but it pales in comparison to the look on your kids’ faces when they feel the surf knock them backwards for the very first time. If you ask me, that’s the magic in taking a vacation. All that aside, as I said, we each had an awesome time on our little adventure. In fact, I decided I’d like a beach house where I could just live, write, and hang out with the family. I just need, like, a million people or so to buy my book for $1 or so. Now…does anybody know a million people?